Claiming for joist repairs or water damage after a leak? IC Assist can help! If you’ve had an escape of water and are claiming on your insurance for joist repairs, just give IC Assist a call. 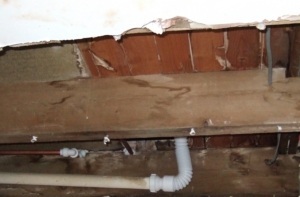 When dealing with water damaged joists, you must act quickly to prevent structural damage to your property. As under the right conditions, rot and mould can spread rapidly (as can be seen in the pictures taken on a claim we were managing for a hidden leak). 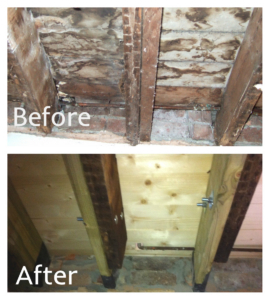 To avoid significant damage to your joists, it’s important to choose a water damage restoration company like IC Assist. This not only ensures you’ll get a professional joist assessment and repair. But it also means we’ll take care of any other resulting damage too. This saves you the time and hassle of dealing with multiple tradesmen. Over the years, we have managed countless water damage property claims involving the treatment and restoration of ceiling and floor joists. Usually, the damage is as a result of a leaking pipe in the bathroom. In most cases we need to repair the bathroom floor, floor boards, joists and kitchen ceiling below. Assessing the damage to establish what joist repairs are necessary. If you don’t know how to repair joists with water damage, don’t worry just leave everything to us. We’ll take a look at your joists and advise what type of repair will be necessary. Please note, that we will need access to your joists in order to check their condition and determine what repairs we will need to carry out. So if a section of your ceiling’s fallen down or you’ve already taken up your flooring, it’s much easier to assess them. However, if there is no access, we will not be able to make a full assessment during our initial visit. This is because we need your insurer’s permission to remove any damaged materials to allow us to carry out an inspection. In these circumstances, we will submit a detailed schedule of works to your insurer for their approval. This will outline all other necessary repairs and will also let them know that we will need to check the condition of the joists. Once your insurer approves your claim and instructs to us proceed, we can then check your joists. We will do this as soon as we remove the damaged flooring/ceiling. If there is any damage, we’ll notify your insurer. We will also forward them pictures of the water damaged joists and a cost to repair them. Water stained joists usually only require drying and treating. If you’ve got water stains on your joists following a small leak then don’t worry. Thankfully, this type of damage is easy to fix, as it doesn’t affect the structural safety of the joist. Therefore we can simply dry and treat any affected beams. In order to do this, we will remove a section of the damaged ceiling beneath the affected joists. Then we can install our equipment to dry any wet timber. Once dry, we will apply a specialist timber treatment to prevent rot developing in future. After this is complete, re-decoration can begin. We deal with ceiling restoration and repairs all the time. Firstly our plasterer will fit new plasterboard and plaster the entire ceiling. Then once the plaster has thoroughly dried out, our decorators will re-paint the entire ceiling. In addition, when re-plastering a ceiling, most insurers usually allow to re-decorate your coving and walls too. If you’ve had a leak that you didn’t notice for a long time, you may have rotten joists. As a result, drying and treating them may not be sufficient. This is because they’re likely to be sodden, which weakens them and affects their structural safety. In these circumstances, we’ll need to carry out more substantial joist repairs. The picture shows an example of substantial water damaged timber. We took this during the removal of a kitchen ceiling. On this particular escape of water claim significant repairs to the joists and bathroom floor were necessary. The damage was as a result of a leaking toilet that the customer did not notice for a long time. We had to remove and replace 9 joists and every floorboard. The remaining beams were dried and treated. (After pictures of the work we carried out can be seen at the top of this page.) Luckily, this customer’s policy didn’t exclude rot and their insurer paid for all the reinstatement work. Beware – some insurance policy’s exclude rot even when it’s the result of an insured event! Exclusion for rot can vary from one policy to the other. Some insurance companies exclude dry/wet rot however it has arisen. Others will cover the cost of joist repairs, if the rot was as a result of an event that your policy covers you for i.e. a leak or burst pipe. 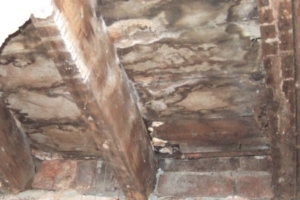 If your joists are rotten, we will check your policy to see if your insurer should cover this. Building Control must be notified when replacing and renewing joists. 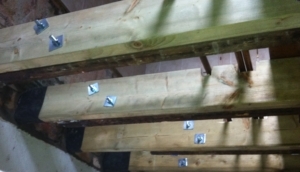 If we need to replace your joists, we’re must notify Building Control. This is because they class this type of repair as structural work. As a result, Building Control must oversee and sign of the work. This is a cost that insurers, Loss Adjusters and general builders can overlook and can have serious implications when selling your home. But don’t worry, we’ll handle everything. From completing the paperwork to notifying Building Control of the proposed works to liaising with their officer. This usually involves arranging site visits before, during and after the works are complete. This gives you peace of mind that any joists we renew are in accordance with current building regulations. We will also ensure you are given a completion certificate, which Building Control issue once they sign off the work. Carrying out joist repairs can involve a lot more than you may think. Usually, it is necessary to remove the ceiling below and the sub floor above the affected area. As a result, ceilings and floors require renewal. This usually involves plastering, re-decorating and plumbing. As insurance claim specialists, we provide a wide range of building services. We have a professional team of plasters, painters & decorators, tilers, plumbers, electricians, carpenters, flooring fitters etc. So we can help with all associated re-reinstatement works required. We can also manage everything for you as part of our FREE Claims Management Service. You can see lots more pictures of joist restoration and all other associated property repairs we have carried out on our Facebook page. Registered Address: IC Assist - Insurance Claim Property Repairs, 5 Ash Tree Court, Woodsy Close, Cardiff Gate Business Park, Cardiff, CF23 8RW.